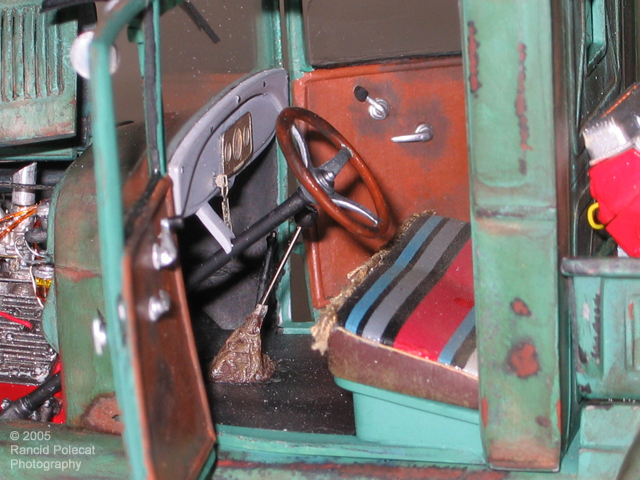 The interior features a mixture of kit, parts box, scratch-built, and photoetched parts finished off with some more of Tommy's weathering. It's hard to see, but if you look closely at the edge of the door in the image above, you can see the the tab for the working door latches (has Tommy been hanging around Bill Geary?) He's also opened the hood louvres, replaced the kit's hinge pins with sturdy steel pins, and installed real chains to hold the tailgate. That wild injected small block Chevy in the bed built up from a Ross Gibson engine kit.